I’ve been wanting a change lately from my JM and Tele. 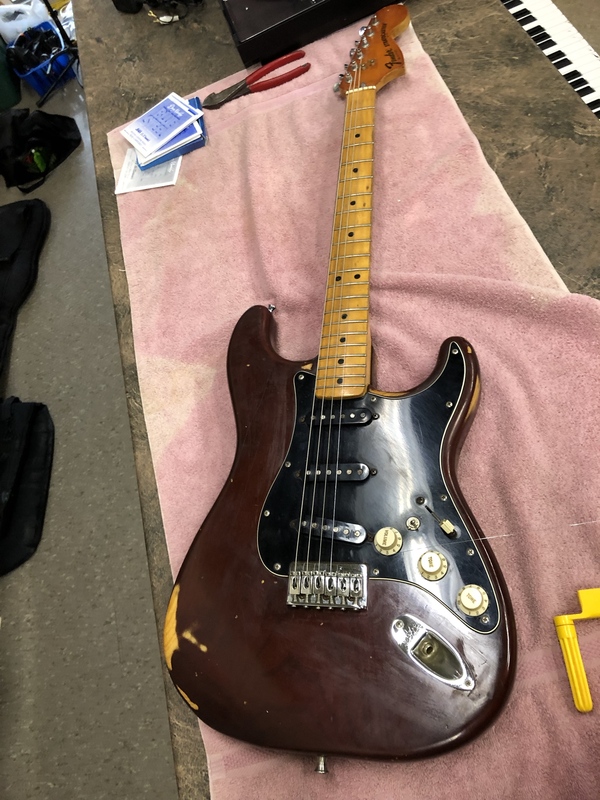 I walked into a pawn shop on Friday and they were prepping a 1979 hard tail Strat for sale. I know, I know, one of the worst years for anything Fender. I’ve tried half a dozen 1979 strats and teles and hated all of them. Mostly dead sounding and too heavy. It’s beat to hell, but mostly original and has a good neck. It looks like someone either tried to relic it, or was trying to take off the first few inches of poly. The only things not original are the bridge and a mid boost/switch wired into the pickguard. The only reason I’m interested is 1) 1979 is my birth year and 2) its surprisingly light for the period, 8 pounds at most (same as my JM), 3) it’s the same price as the higher end of a used MIM Strat. I know I’d play the heck out of it, and it was comfortable enough that it would be with me for quite a while. It sure is ugly though. I’m going back to see if it’s on the floor tomorrow. I couldn’t make it there yesterday so it may have sold. So what say the group, am I crazy? Everybody needs a Strat (or 2)! But brown guitars are boring, and maple necks are boring! Grab it now - but don't! I wonder if you have an X-1 pickup in the bridge position there? That would be cool. I say go for it, it is kind of ugly, but who cares... if it plays and sounds good for you then what else counts? I’ve already been joking with my wife that I’ll call it the shatocaster. Tough to say, the bottoms looked grey in the pics the guy showed me. I’m assuming it’s a 79 based on the serial, and the pots all dates to 78 and 79. Still you never know. The mid boost intrigues me, but it may end up getting yanked if I don’t like it. Can’t wait to plug it in, I just wish the best amp in the shop wasn’t a line 6 spider with an 8” speaker. Strats are wonderful and you should have one. But, there is no reason to ever own a hardtail strat. I believe that color is called Mocha. I hope it's still there wating for you when you get back. As long as you like how it feels, its worth it. Good luck! Yeah, that's my only quibble... then again, "the Hitmaker" is a hardtail Strat and that one sounds pretty good. Strats are wonderful, and the more I play guitar the more I appreciate them. They're just perfect workhorses. I actually really like hardtail strats, they have a nice woodier sound than normal strats. I had a hardtail Bullet Strat that sounded very nice. Hard tail doesn’t bother me. When I’ve owned strats in the past I’ve never been into the trem. Setting up the trem was one of the major reasons I sold my last strat. I don’t like doing it for some reason. Don’t get me wrong, if it had a trem I’d set it to float and use it, but it’s not taking the place of my JM. Clean it up (that will do a lot). Put an aged MOP pickguard on it to dress up without refinishing, and is reversible. set it up. I think Strats get a bad reputation because they can be made to sound terribly cheeseball. But they can also sound downright great (and not remotely cheeseball) in the right hands—Built To Spill, Pavement, Yo La Tengo just to name a few. If you have the itch there’s no reason not to get a Strat. great OSG deals with: ncarey13, skip. Agreed, strats get some great tones. I just love the 1/3/5 positions. 2 and 4, while iconic, just conjure up images of cheesy chorus-laden wedding band tones for me. If it's a birth year guitar and the price is right, I say go for it. I picked up a birth year strat, myself, so I could really argue against it!